One of the prerequisites of the ecommerce tracking script is telling Google about every individual item in a transaction. I’ve seen setups whereby the script is pulling in total basket value data but not cycling individual items (and therefore not providing data on individual item purchases). It’s all too easy to pass incorrect values into each of the variables. Take care to pass through total order value without VAT as tax should be listed as a separate value later in the code. This gets trickier as the visitor is taken off-site. When this happens, it’s important to add extra code to pass data correctly through a third party payment provider using Cross Domain Tracking. These posts have proved useful in implementing tracking for WorldPay and PayPal. 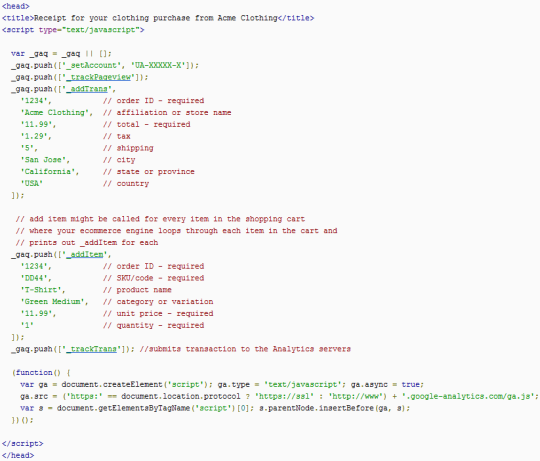 What else can be done with the ecommerce tracking script? More often than not I’ll see the ‘category or variation’ variable being loosely used. As most retailers sort their products into multiple categories it’s not always easy to identify this value unless products have been specified a master category. As per Google’s example above they’ve added the product variation which includes colour and size. But this got me thinking that you could pass anything of interest into here. Sale items – You could pass through whether the product that has been purchased was reduced or part of an offer. It may be that some items on the site are discounted while others remain full price. This will allow you to quickly filter in Product Performance items in sale. Although this may be indicated in the product price it’s unlikely you’ll know the reduced price for every item on your site. Featured item – The product may be promoted throughout the site in featured banners. You could pass a value through which will identify it as a featured item to see if it performed better as a result. Payment provider – Although there are a number of ways of tracking which payment provider has been used it could also be passed into this variable also. New/Used – Specify when the item sold is new or used. (Although this may be referenced in product titles or the product code). The potential for adding extra tracking granularity is as limitless as your creativity and your developer’s skills. You could even combine the various variables above into one value and then you can filter by all the variables and set up Custom Reports based on the category attributes! You don’t need to sell monetary items in order to use ecommerce tracking either. Google’s official Analytics Blog recently posted how Nissan uses Ecommerce Tracking without selling.